They defeated Monaghan by three points in Castlebar. 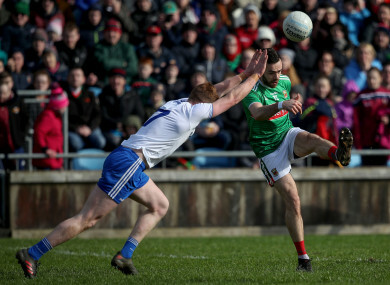 MAYO WERE MADE to work for it by a tenacious Monaghan side who never threw in the towel – but the managed to hold on and book their place in the league final for the for the first time since 2012. Monaghan hit the front inside the opening minute with the opening minute with Jack McCarron hammering over a long range effort with the aid of a strong breeze. Five minutes later Mayo plundered their first score of the day when Kevin McLoughin got on the end of a move started by Aidan O’Shea who picked out Darren Coen with a top class pass, the Mayo number 14 showed composure in finding McLoughin closing in on goal and he slipped it to the back of the net. Monaghan almost rattled the back of the net themselves three minutes later when Karl O’Connell burnt the Mayo defence for pace – but David Clarke stood him up and pulled off a great save at his feet. Malachy O’Rourke’s men closed the gap to a single point on the ten minute mark thanks a Conor McManus effort from 35 meters out and two minutes later it looked like he would be awarded a penalty after it he got in behind the Mayo defence and appeared to be hauled down inside the penalty area – but Derek O’Mahnoy waved play on. McManus then pulled an effort from a free wide before McCarron levelled it up just before the quarter of an hour mark. James Horan’s side found a purple patch after that effort and reeled off four points on the spin with Fergal Boland slotting over two fine efforts along with a pointed free from Jason Doherty and one from play off the boot of James McCormack – to leave Mayo four to the good. Ten minutes before the break a probing ball into the Mayo defence found McCarron who swung over his third of the day to cut the gap back to three. The same man kicked his fourth of the day to cut the difference back to just two. What McCarron was doing at one end Fergal Boland was doing at the other seven minutes from the short whistle he made the gap three points again with his third top class point of the half for Mayo. Mayo plundered their second goal 31 minutes in when McLoughlin was once again the right man in the right place to finish off a move involving Aidan O’Shea, Diarmuid O’Connor and Fergal Boland. However they were dealt a blow when David Clarke had to be replaced after he was caught by Darren Hughes after claiming a dropping effort by Conor McManus. McCarron and Aidan O’Shea traded points to keep the gap at six points, before Mayo blood sub Brian Reape showed some smarts to claim a mark and slot over the resulting ball to push his side seven clear at the short whistle. McCarron continued his good first half form into the start of the second half getting his sixth point a minute after the restart, both goalkeepers then traded pointed frees before Conor McManus came alive and kicked two fine scores to leave the score at 2-8 to 0-10 with half an hour left to play. However the Farney men’s chances were given a serious blow when they were reduced to 14 men after Fintan Kelly was shown a straight red for a high challenge on Fergal Boland. Mayo tagged on two quick points from Darren Coen and Kevin McLoughlin to go six clear again – but just before the quarter hour mark in the half Darren Hughes rattled the back of Hennelly’s net after being played in following good play by O’Hanlon and McManus. Almost instantly Mayo hit back with Diarmuid O’Connor making a surging run playing the ball across the face of goal to Kevin McLoughlin who saw his hat-trick effort brilliantly saved by Rory Beggan – however the ball ended up the back of the net of off the rebound. Brendan Harrision then pointed for Mayo before McManus hit back with a free for Monaghan to leave Mayo six clear again. Points from McLoughlin and Doherty not long after had them eight clear and looking home and hosed. Monaghan weren’t going away and McManus tapped over three frees in quick succession with McCarron adding another to leave just four between the teams with seven minutes to go. The Monaghan marksman cut the gap back to just three points on 64 minutes and had the comeback looked like it could be on. Conor McCarthy cut the gap back to a just two with a well taken score after Monaghan turned over the Mayo attack on half way and the home crowd were starting to get nervous. Those nerves were eased a little bit by a point from Diarmuid O’Connor to keep three between the sides. Donal Vaughan pointed to put four between the teams – but Ryan McAnespie made sure it was going to be a nervous finish for both with a top class score to leave just three between the sides as the game went into injury time. And that’s the way it stayed with Mayo holding on to book their place in the league final next weekend thanks to Tyrone’s win over Galway in Omagh. 21. Ciaran Tracey (Ballina Stephenites) for Boland. Email “2-2 from McLoughlin helps Mayo book first Division 1 final in seven years”. Feedback on “2-2 from McLoughlin helps Mayo book first Division 1 final in seven years”.